One of our lovely clients Karin & Pontus from Sweden were overwhelmed with their new born baby Hannes and conveyed their thank you wishes by sending us a beautiful bouquet and a cake. Please note that SI will remain closed tomorrow i.e. 25th January, 2014, hence reply to the mails may get delayed. However, you may always give us a call on emergency situation. The founder of a hi-tech surrogacy clinic in Basaveshwarnagar has been arrested and sent to jail on the charge of “cheating” more than 30 people who alleged that he failed to keep his promise to help them get babies through surrogacy and egg donation. The Health Ministry has adopted recommendations made by the National Council of Midwives and Gynecologists regarding IVF treatment for infertility, Maariv/nrg reports. The new guidelines will mean that women aged 39-42 can begin government-funded IVF treatment more quickly. However, the guidelines also call to limit IVF treatment for women over the age of 42. The Council of Midwives and Gynecologists has advised that limiting government-funded IVF for women over age 42 could actually increase their chances of pregnancy, by freeing up funding for egg donation – a treatment option which doctors say has a higher chance of success for that age group than IVF alone. The practice of assisted reproduction using a surrogate parent in India has received a boost, with the central government allowing import of human embryos for such purposes. The notification, issued a couple of weeks ago, will help overseas couples, including Indians settled abroad, to import embryos that can be implanted in the womb of a surrogate mother here. "Several couples from abroad who have good quality frozen embryos often look for surrogacy options in India. Also, many Indian couples temporarily settled abroad may have undergone IVF treatment there and want to import embryos for further development here. This relaxation in import norms will benefit them," said Dr Hrishikesh Pai, presidentelect of the Indian Society of Assisted Reproduction. Such couples will be subject to stringent checks. They must be heterosexual, married for at least two years, and show proof of infertility of at least one of the couple. Embryo import will also be allowed only after the couple has obtained a no-objection certificate from the Indian Council of Medical Research (ICMR). Several dozen surrogate babies born, or about to be born, in Thailand — through the arrangements of Israeli couples — are unable to come to Israel because the Interior Ministry has not granted Israeli citizenship to the infants, according to an advocacy group formed around the issue. There are currently some 65 babies stuck in Thailand that were conceived by homosexual Israeli couples, according to the group “Help Us Bring the Babies Home.” The group formed a Facebook page last week that has already garnered some 14,000 “Likes” and the support of Gal Uchovsky, a prominent Tel Aviv LGBTQ activist and journalist. The group has focused its attention on Interior Minister Gideon Sa’ar, and is planning multiple demonstrations outside his Tel Aviv home this week, culminating Thursday in a large rally organized with the help of various LGBTQ organizations. 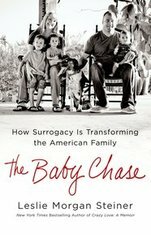 “The Baby Chase: How Surrogacy Is Transforming the American Family,” by Leslie Morgan Steiner, was among the best books on family from 2013. I’ve been meaning to share it with you for some time, and Amy Klein’s post about donor eggs (“Would a Pregnancy Through a Donor Egg Feel Like ‘Mine’?”) and the resulting discussion of the medicine and ethics of egg donation, and in particular overseas egg donation, provided a perfect opportunity. If you’re at all curious about egg donation and surrogacy (in fact, if you’re just a curious reader at all), “The Baby Chase” makes a fascinating read. Shah Rukh Khan spotted with Abram as he returns from vacation! Shahrukh and Gauri are very protective parents especially for their third child AbRam who is born through surrogacy. The Don of Bollywood gave an example of his determination when he returned with family from the New Year vacation and made a remarkable exit from the airport. He justified his popular dialogue “Don ko pakadna mushkil hi nahi namumkin hai” by keeping his newborn son away from the paparazzi. Team SI wishes everyone "Happy Makar Sankranti"
The first celebration that welcomes a warm festive beginning to the New Year is the Makar Sankranti festival. Makar denotes the Zodiac Capricorn while Sankranti denotes transition. On this day, the Sun enters into Capricorn making the occasion special for us to celebrate! On this day people exchange multi-colored tilguds made from til (sesame seeds) and sugar. While exchanging tilguls as tokens of goodwill people greet each other saying – ‘til-gul ghya, god god bola’ meaning ‘accept these tilguls and speak sweet words’. The under-lying thought in the exchange of tilguls is to forget the past ill-feelings and hostilities and resolve to speak sweetly and remain friends. The proposed Assisted Reproductive Technology (Regulation) Bill 2013, that aims to regulate surrogacy in India, must wait longer as the Union health and home ministries have differences over singles opting for surrogacy in India. While a 2012 home ministry diktat says gay couples and single foreigners are not eligible to have an Indian surrogate bear their child as only a foreign “man and woman” married at least two years will be granted visas, the health ministry feels single parents, including foreigners, should be allowed surrogacy. Karin and Pontus with their baby boy Hannes, who was born on 3rd January, 2014 . Baby boy & baby girl born on 6th January, 2014 to the proud parents from USA. Congratulations for the bundle of Joy!! On the New Year, we are proud to announce the release of our redesigned website www.surrogacyindia.com updated with the information about our products and services. You will be able to review all the information, watch the videos and read the most updated news. We hope that you will enjoy browsing our new site, finding more options and information.